Tradespersons from The Dragon Group assisted Hendricks International with their fit-out of an end of trip facility in Sydney’s CBD. The three-month project saw several tradespersons from Dragon Labour Hire contributing their skills to the project. An exciting wellbeing concept trending in new construction projects across Sydney, end of trip facilities promote healthy lifestyles for businessmen and women working within the new buildings. Designed primarily for bike riders, these top quality amenities also benefit runners and walkers, and encourage working professionals to take up exercise throughout the working week with the assurance of suitable shower and changing facilities. End of trip facilities typically offer bike racks, relaxation areas, and shower and changing amenities. Densely-populated cities rarely offer spaces to park a bike, forcing many to opt for public transport as a quicker, easier and less stressful way to start their day. However, this particular end of trip facility in Sydney’s CBD provides over 100 spaces in the car park to encourage more people to take up bike riding, not only for a healthier, more active morning but also to reduce emissions to be environment-friendly. A relaxation room in an office building offers an opportunity and the space for employees working within to unwind and relax. The Sydney CBD facility offers a Hydration Bar that provides snacks, beverages and comfy seating for all. An important feature of all end of trip facilities, showers and changing amenities allow active people to clean up after an exercise session or bike ride. 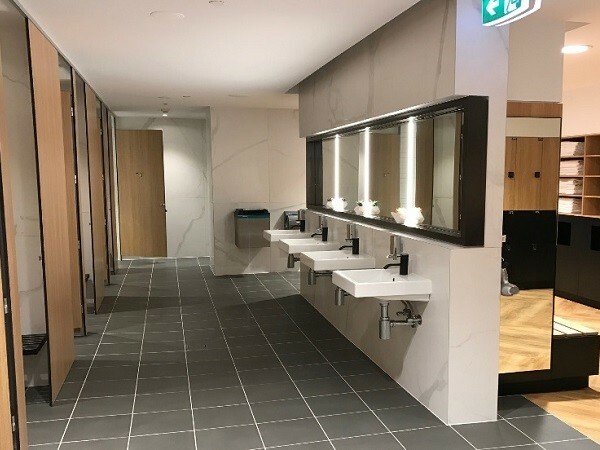 The end of trip facilities at the Sydney CBD provide showers and spacious unisex changing rooms, enabling working professionals to head back to the office feeling and looking fresh. If you are planning a new development or your business is interested in improving the health of your employees and their all-round work culture, an end of trip facility could be the next step for you.